Can anyone qualify these transmission bearings. The bearing on the clutch side is easy to find in any bearing catalog, it is standard size and has number 6207. OD 72mm, ID 35mm, W 17mm. When it is sealed or metal shielded, the bearing has a prefix after the number. The bearing I recommend has a rubber seal on both sides so the number 6207-2RS. There is bearings with no seal, seal on one side, or metal plate shielding, but the recommended bearing is lubricated for life and is maintenance free. Just use a well known manufacturer. On the sprocket side there is a special bearing that can be difficult to find and quite expensive. The number is 98207MB. Rumour tells it is also used in some English vintage motorcycle brand. Observe that some specifications can have wrong measures, true measure is OD 70mm, ID 35mm, Width 10mm. That bearing is impossible to find shielded. One manufacturer that I know for certain make that bearing is RHP in England. Knowing the manufacturer can be a help for the shop where you order the bearings. The RHP bearing is a compromise as it is not exactly as a original bearing. 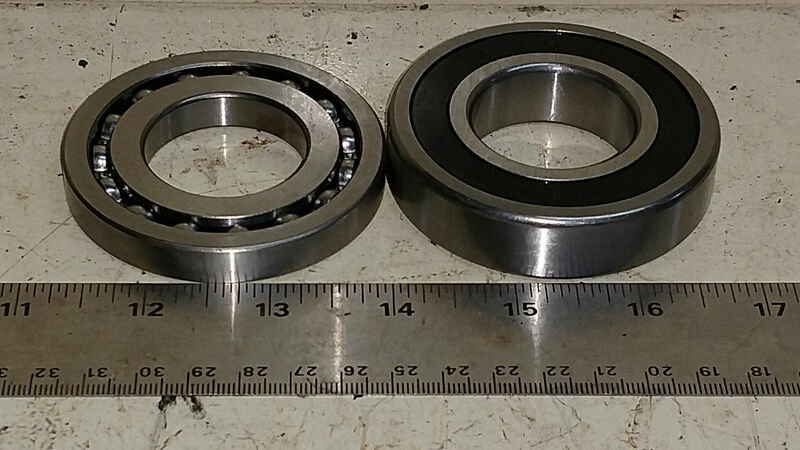 Original bearing has more balls in it and no ball retainer, a "maximum capacity bearing", but exactly same is impossible to find. That bearing is exposed to the most wear and tear from the tremendous jerk and shock from the chain, so it should be replaced when opportunity comes. Thanks Carl ...I’m about to embark on a quest, to locate a harsh vibration, at 40 mph, on my 1931 101 scout. I first need to distinguish whether this vibration, is coming from the engine or transmission ? Any suggestions please. Aha, could be the old oscillatring idler gear? shot bearings , too much end float/not enough end float gearbox not shimmed to allow a little backlash in gear train ? I find myself in the same place, vibration from somewhere in the drive train in all gears above about 1/2 throttle, particularly noticeable in top. Looking through the manual and studying the tech updates I don’t see any guidance for sprocket side play and initial cursory look there is definitely some there. Any advice would be good, first glance there doesn’t appear to be any discernible end float on the shaft but gearbox sprocket has very obvious play which does also appear to also translate through to the shaft. Not only the idler gear bearing fit and shimming is important (0,4-0,6mm -.015 to .025in) along with the proper gear play. The gear play should be set so there is an audible click all the way around, not less as the basket expands when hot. That is adjusted with shims at the gearbox lugs. But also what is important is the clutch basket bushing for the mainshaft. The basket is only supported on a single row ball bearing and the basket can rock on the shaft if the bushing is bad, inducing oscillation! Specially bad if the basket is a bit oval, as it tends to be in most engines, more or less. You can check furter with magnet fishing at the bottom of the gearcase, if you catch a lot of metal debri it might be a sign that the gears doesn't have the right distance from each other. I would make a steel wire hook, and try to lift and rock the countershaft to check if the clustergear or the shaft is loose in its bushings, the one that wear most is that bushing close to the sprocket. The shaft should be firm and lightly knocked in the sprocket side bushing and push fit in the clutch side bushing. The wall in the gearbox for the countershaft bushing on the sprocket side isn't that strong, it absolutly needs support on the outside when a new bushing is knocked or pressed in. Heat the case before, but not more than spit sizzles on the area. A sensible modification on the cluster gear shaft is to drill and thread the clutch side end for a retractor bolt..